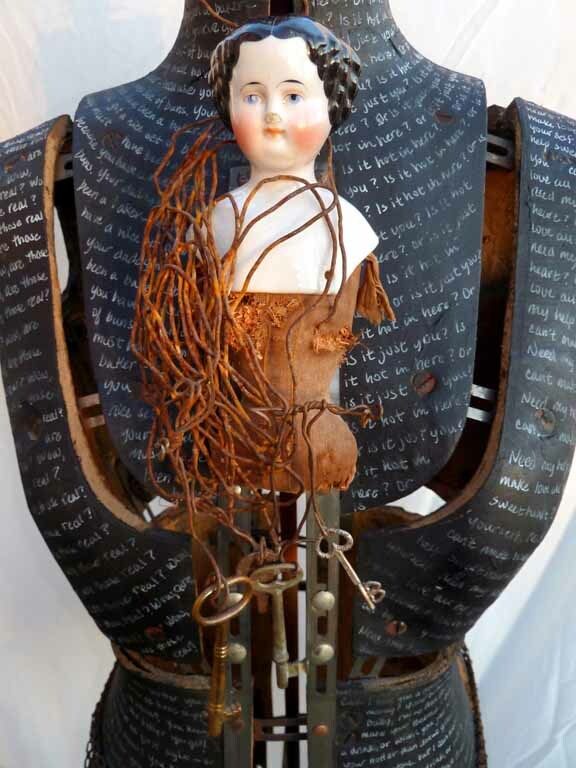 “Key to My Heart” is the third in a series of the female body shape using as its base, a vintage dress form. The focus of the series is relationships as seen from a woman’s perspective and the applied behavior of our society. 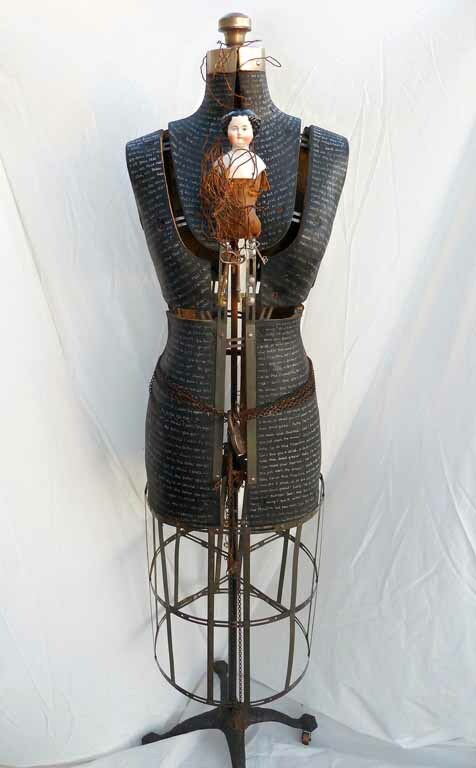 The dress form in this piece is the oldest one in the series. Made in the Victorian era it has an awesome metal anchoring base. Stripping the form down to its bare elements I was pleasantly surprised when I found a black base, not a cardboard brown base like the first two in the series. It reminded me of an earlier piece of mine that Craig Smith Gallery exhibited called “i believe” where I used a black, almost chalk board base, to hand-write in white. With that inspiration I moved forward with my original concept to treat the body sections of the dress form similar to that of a butcher’s meat chart. My idea was to treat a quite serious subject with a bit of light humor and highlight some ridiculous and effective pick-up lines used by men to garner a woman’s attention. Over time, I gathered the pick-up lines. For each body section of the dress form I chose two or three pick-up lines. I then covered each section by repeatedly hand-writing the pick-up lines. I wanted to show the contradiction between courting of the past and today’s dating so I used the Victorian base as a point in time and added the fragile Victorian doll head. I see her as the face of women, solid yet easily broken if not handled with care, e.g. her imperfect nose. I attached vintage and antique keys to the doll’s head with a tangled wire. Included is a special key with the inscription “key to my heart.” It’s very small, so it is not easy to see the inscription. The keys and the tangled wire symbolize the path taken to reach a woman’s heart. I also include either a keyed lock or padlock on each piece of the series. They are symbolic of a chastity belt in addition to repeating the conceptual question, how do you reach the heart of a woman? In March I was invited to the inaugural opening of Arch at Chatham art and auction space in downtown Indianapolis. I took this piece to share, although it wasn’t complete. I had a lot interest in the work and it brought a lot of conversation. Many laughed and joked about the lines. One man asked me if all those lines were said to me… I asked him if that was a pick-up line too? One man, a friend of mine, asked if I had paper and pen. He wanted to write down some of the lines! “Key to My Heart” was completed in anticipation of delivery to Craig Smith Gallery for ART ATTACK 2012. I delivered it to the gallery on April 26th. I had similar response at the Craig Smith Gallery over Art Attack weekend as I did at Arch at Chatham, a great deal of interest, intrigue and conversation. That is the best compliment to me as an artist – my work initiates thought and interaction. This piece was recently acquired by a collector at Craig Smith Gallery, Union Pier, Michigan. My sincere thanks and undying gratitude to the collector for their patronage. All rights reserved, copyright ©2012, Satch. This website contains copyrighted material, trademarks and other proprietary information, including, but not limited to, text, photos, video, graphics, music and sound, and the entire contents are copyrighted as a collective work under the United States copyright laws. Users of this website shall not publish and/or distribute without written permission such material (in whole or in part) and/or to incorporate it in other works in any form, media, or technology now known or hereafter developed.